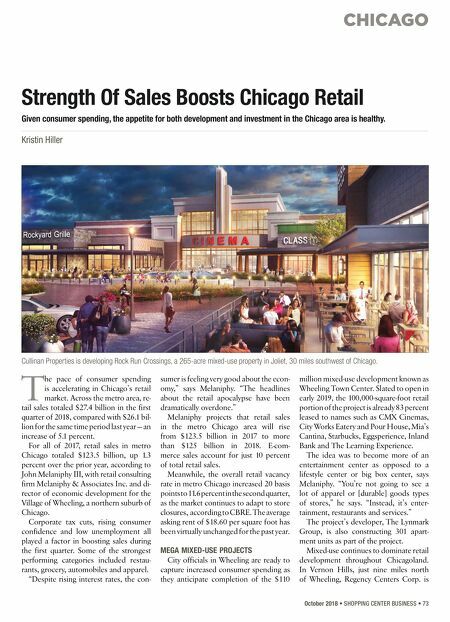 CHICAGO October 2018 • SHOPPING CENTER BUSINESS • 73 T he pace of consumer spending is accelerating in Chicago's retail market. Across the metro area, re- tail sales totaled $27.4 billion in the first quarter of 2018, compared with $26.1 bil- lion for the same time period last year — an increase of 5.1 percent. For all of 2017, retail sales in metro Chicago totaled $123.5 billion, up 1.3 percent over the prior year, according to John Melaniphy III, with retail consulting firm Melaniphy & Associates Inc. and di- rector of economic development for the Village of Wheeling, a northern suburb of Chicago. Corporate tax cuts, rising consumer confidence and low unemployment all played a factor in boosting sales during the first quarter. Some of the strongest performing categories included restau- rants, grocery, automobiles and apparel. "Despite rising interest rates, the con- sumer is feeling very good about the econ- omy," says Melaniphy. "The headlines about the retail apocalypse have been dramatically overdone." Melaniphy projects that retail sales in the metro Chicago area will rise from $123.5 billion in 2017 to more than $125 billion in 2018. E-com- merce sales account for just 10 percent of total retail sales. Meanwhile, the overall retail vacancy rate in metro Chicago increased 20 basis points to 11.6 percent in the second quarter, as the market continues to adapt to store closures, according to CBRE. The average asking rent of $18.60 per square foot has been virtually unchanged for the past year. MEGA MIXED-USE PROJECTS City officials in Wheeling are ready to capture increased consumer spending as they anticipate completion of the $110 million mixed-use development known as Wheeling Town Center. 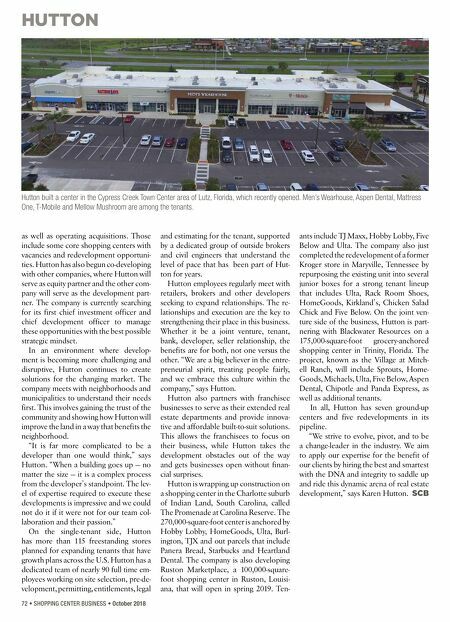 Slated to open in early 2019, the 100,000-square-foot retail portion of the project is already 83 percent leased to names such as CMX Cinemas, City Works Eatery and Pour House, Mia's Cantina, Starbucks, Eggsperience, Inland Bank and The Learning Experience. The idea was to become more of an entertainment center as opposed to a lifestyle center or big box center, says Melaniphy. "You're not going to see a lot of apparel or [durable] goods types of stores," he says. "Instead, it's enter- tainment, restaurants and services." The project's developer, The Lynmark Group, is also constructing 301 apart- ment units as part of the project. Mixed-use continues to dominate retail development throughout Chicagoland. In Vernon Hills, just nine miles north of Wheeling, Regency Centers Corp. is Strength Of Sales Boosts Chicago Retail Given consumer spending, the appetite for both development and investment in the Chicago area is healthy. Kristin Hiller Cullinan Properties is developing Rock Run Crossings, a 265-acre mixed-use property in Joliet, 30 miles southwest of Chicago.